Do you suffer from back pain and want to look for a new drug free solution that actively works with your body to relive lower back pain? 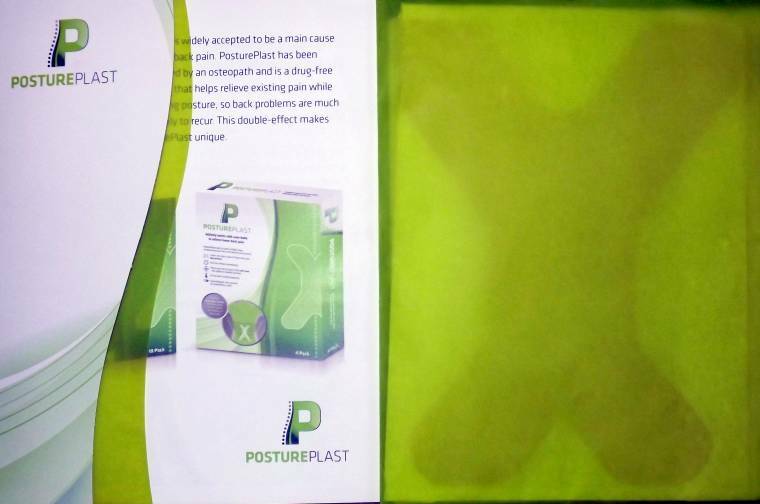 They have introduced a whole new way of targeting back pain which allows people who are affected to continue with an active life.This is a drug-free solution that helps relieve existing pain while correcting posture so back problems are less likely to recur.Posture is a main cause of lower back pain.PosturePlast tackles the source of the pain,not just the symptoms. This is a X-shaped plaster that is quick and easy to apply encopassing flexible struts which controls your movement and keeps your back in optimum safe zone.It get to work straight away by giving active support when sitting,standing or lifting.By doing this ,it not only helps provide fast pain relief,but also works the body,re-educating and retraining the wearer to have better posture. 1 in 5 people will visit their GP at some point this year with a bad back. It is estimated that 80% of adults will experience some form of lower back pain in their lifetime. We were sent 3 to try but at the minute me or my husband don’t have back pain I think these sound great for people who suffer with back pain and a great drug free way of dealing with the source of the problem. I do get back pain from time to time though leaning over the computer and running so the next time I do I will be reaching to try these..
Nice post. I’m using a similar product called postureright. It’s from lutaevono and really really helps my back from getting stained!